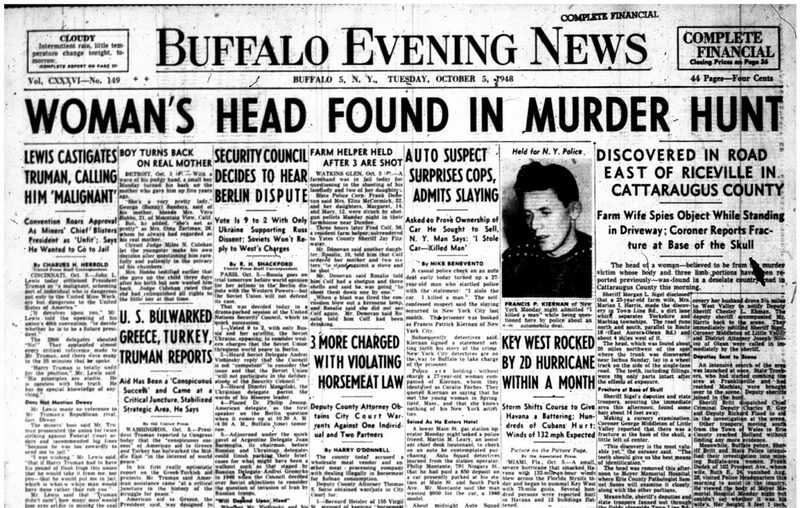 The murder of Helen Lindeman made the front page of the Oct. 5, 1948, cover of the Buffalo Evening News. On the early evening of Saturday, Aug. 21, 1948, 38-year-old Helen Lindeman – clad in a pink sleeveless housedress to combat the late summer heat – ventured out into her Kenmore neighborhood to run a few errands and to purchase a quart of milk. Lindeman was last spotted on Delaware Avenue at around 6 p.m. that night, walking just a few hundred feet from her home on Landers Road. The auburn-haired housewife would never again be seen alive. The question of Lindeman’s whereabouts mystified the Western New York community – and scores of local police departments – for the next several weeks. Rumored sightings of her abounded, from Crystal Beach, Ont., to Grand Island to Delevan, N.Y. When Helen Lindeman’s husband, Dr. Howard C. Lindeman, returned home from taking the couple’s 2-year-old daughter for a walk in Delaware Park later that evening, neither Helen nor the quart of milk were anywhere to be found. It appeared she never made it home from her errand that night. Purported sightings of Helen Lindeman poured in from all over Western New York during the next few weeks. Residents in Delevan claimed to have seen a mysterious auburn-haired “woman in black” nervously hitchhiking through their town on Aug. 22, the day after Helen’s disappearance. Similar reports led police to investigate claims in Grand Island, Crystal Beach and in Helen’s native town of Lockport. All of those tips proved fruitless for investigators, the Courier-Express lamented on Sept. 19, 1948. A break in the case finally came on Sept. 27, 1948, when a severed forearm and knee joint were found along a “lonely country road” in Wales. Another knee joint was located across the street two days later, leading detectives to theorize that the body parts had likely been hurled by two individuals seated on opposite sides of a moving vehicle, the Olean Times-Herald recalled on Aug. 22, 1949. Police determined the body parts had been detached by someone using a hacksaw and knife. When a decapitated torso was found along the roadside a few dozen miles away in the Town of Ischua on Oct. 3, 1948, the press dubbed the unknown assailant “Buffalo’s Torso Killer.” That was a nod to Cleveland’s Torso Murderer – a notorious serial killer who dismembered his victims in a similar fashion – of the 1930s. Front cover of the Oct. 6, 1948, edition of the Buffalo Courier-Express, detailing the identification of Helen Lindeman's scattered remains. According to the Olean Times-Herald, doctors determined, based on the rate of decay, that the torso had been lying by the roadside for about four weeks and that it matched the other body parts found in Wales. 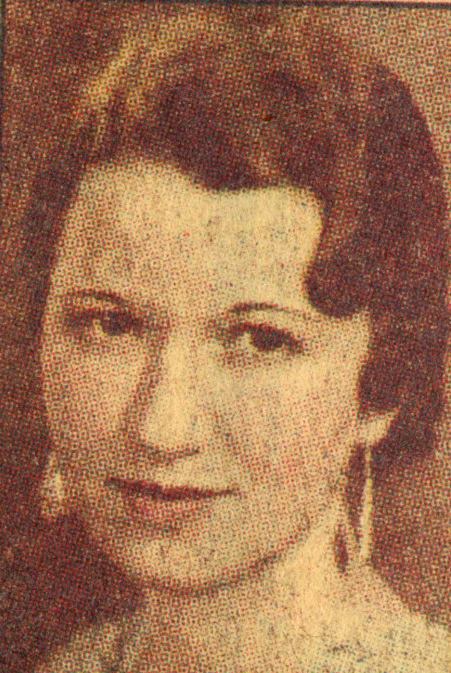 That meant that if the remains did indeed belong to Helen Lindeman, she had still been alive for at least a week after her disappearance. 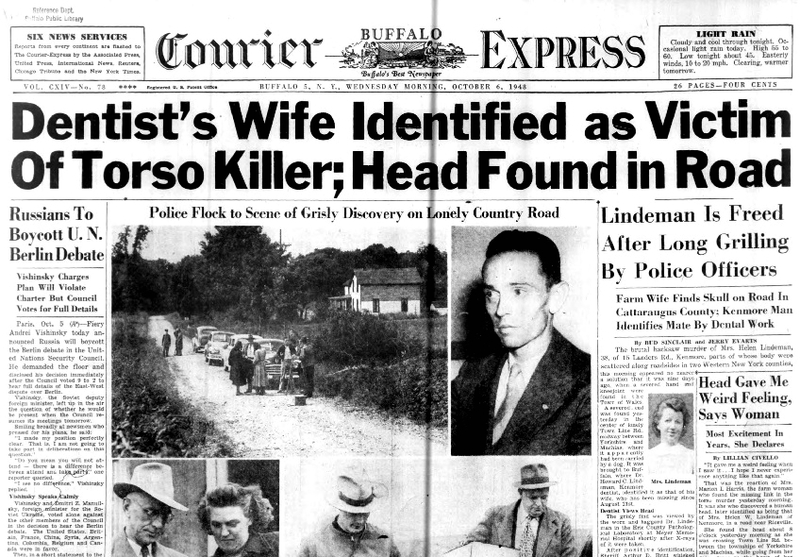 On Oct. 5, 1948, a woman found a severed human head lying on a dirt path near Two Line Road in Riceville, N.Y. Police later theorized that the head – which had a fractured skull – had been thrown from a vehicle on the main road and was then carried to a nearby dirt road by a dog or other animal, the Courier-Express reported the following day. Dr. Lindeman identified the head as belonging to his wife; though he possessed none of her dental records, years of experience as Helen’s dentist had made him familiar with her mouth and prior dental procedures. 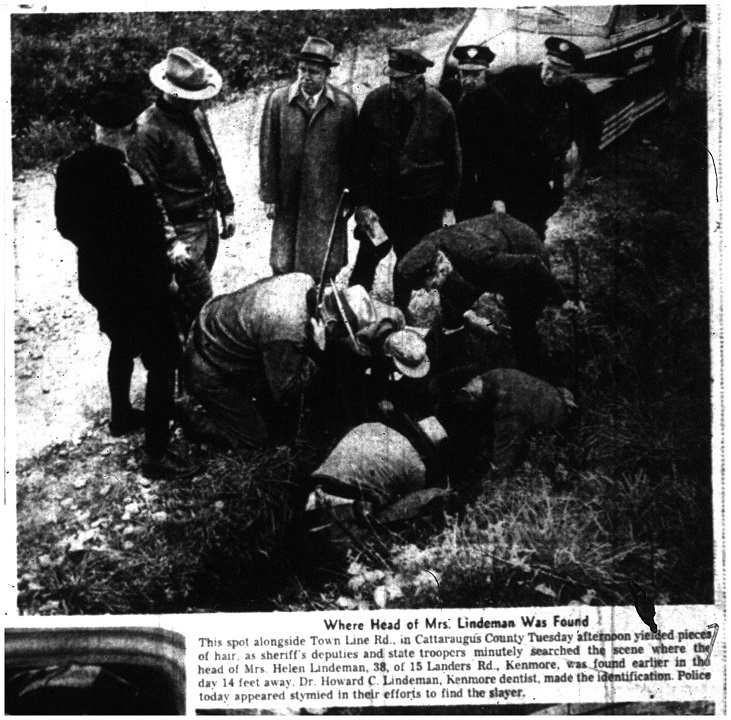 Photo from the Oct. 6, 1949, edition of the Buffalo Evening News: Detectives searching for clues along Two Line Road in Cattaraugus County, where Helen Lindeman's severed head was found Oct. 5, 1948. Both police and press initially suspected Dr. Lindeman had murdered his wife, but the devastated father of one was consistently adamant about his innocence; he endured hours of police questioning and allowed a thorough search of his home and vehicle. As Dr. Lindeman pointed out to The News on Oct. 9, 1948, if he had a crime to cover up, he would not have assisted detectives in identifying his wife’s remains. The remains were indeed those of Helen Lindeman. But the identity of her remains was virtually all investigators were ever able to firmly determine in the case. The investigation, which involved dozens of officers from several different jurisdictions in two different counties, never turned up substantial leads or evidence, and it remains unsolved to this day. If forensic science had been more advanced at the time of the crime, or if the investigation had been centralized to fewer investigative agencies, then perhaps we might now know the identity of Helen Lindeman’s killer, who has almost certainly since died.